It's hard to believe, but Live 7 is already there. The miracle software from Berlin-based Company Ableton, both a tracker and a sequencer at the same time, is constantly evolving: we were just beginning to control Live 6 and its numerous new features when its follower arrived, of course filled with improvements and surprises. Throughout this article we'll try to see, apart from describing the new functions, if Live 7 fills the gaps left by the previous version, what it brings and what it removes from our music, on stage and in the studio. The defaults of its qualities? With this version the German editor introduces Ableton Suite, a pack including Live 7 of course but also a wide panel of instruments one will otherwise have to pay for: the classics Operator and Sampler as well as 3 new ones: Electric, Tension and Analog, all coming from the Canadian editor AAS. By the way 3 sample collections (Drum Machines, Session Drums and Essential Collection 2) are also included in collaboration with SONiVOX and Chocolate Audio, the first of which being the only one to be present in the downloadable version of the soft. This is the one we tested for this review in order to get a broad vision of the new possibilities. As a first impression, the design and almost every single menu and preferences stay the same here, which led us to wonder if we were not dealing with Live 6.1. An impression to be confirmed or not after having installed all the available Live Packs we got. Well, here we go! But let's begin with the sound. Indeed a lot of people complain about Live's sound, often described as too soft and not really transparent – which never prevented Murcof or even Björk to use it on stage until now anyway. It is actually true that Live colours the sound in its own way, and the time-stretch algorithms are getting a little old. Those who were expecting a new audio engine might be disappointed, and yet… From now on every single point in the mix is calculated in 64 bit, and the algorithm for the conversion of sampling frequency (Hi-Quality button) has been improved. Finally you can find the POW-r Dithering (among other things) in the new Export Audio / Video menu. There is few novelties concerning effects but some nice evolutions anyway, like a Hi-Quality parameter made to reduce aliasing on EQ Eight, Operator, Dynamic Tube and Saturator. There's also a new Sidechain circuit, which had always been missing, on the Auto Filter, Gate and Compressor effects. The Compressor benefits from a nice improvement as it totally includes the old Compressor I and II while adding a new "analog" mode with feedback, new EQ options and an enhanced peak mode. The ratio can go up to infinite, which transforms our plug into a limiter, and an Opto model has been added to the old Peak and RMS for our pleasure. The sound is fine and globally soft, yet the possibilities are really increasing. But in the end the only really new effect, although it doesn't produce any sound, is Spectrum, a good-looking real-time FFT spectrum analyser that can be expanded visually with a double click. Alas it can't be frozen to analyse calmly a waveform, and even worse it doesn't offer a horizontal zoom on the frequencies… Well, let's say it can easily be improved. Besides we found a new and extremely practical function with the new and well-thought External Audio Effect Module, which allows, as one might guess, to use an external effect processor as insert on any track. None of this is in any way revolutionary but still, it allows to trim the FX input/output gains, the phase and the latency induced (in milliseconds or samples), in order to compensate for eventual FireWire/USB connections or for our soundcard's buffers. Furthermore this module fills a real gap, as for the first time we can use external effects in a Return track with real sends for each other track. And strangely enough, Live's documentation doesn't even mention it… Nevertheless it was high time! Of course, any use of this kind of module will make the Bounce operate in real-time. Same for the freeze function. Note that there's an equivalent to this for MIDI with the External Instrument module, which will send MIDI to an external synth and will receive audio from this same one in real-time, with associated gain and manual latency compensation. Fine and just as good as its cousin. About MIDI now (OSC is still not integrated) we first found the possibility, finally, to modify rhythmic signatures within the course of the arrangement. Even better, Live 7 allows to place these changes precisely wherever you want them to be (and not necessarily on the first beat), introducing hereby the concept of fragmented bars. Note that it is also possible to change signature in the Session screen via the Scene names, just the same way we could already change the tempo. Nice. Officially Live 7 also allows the slicing and use of REX files now, but it goes quite further: to make it short it is possible to slice any audio file into regions, and to assign these regions individually to Simplers in a Drum Rack, or better to a Sampler if you own it. The whole thing is automatically played via a MIDI clip, and allows to completely modify the structure of a clip while working on the sound of each of its elements, if need be. The result is frankly amazing and reminded us of the Devine Machine, with fewer options though. Regrettably the 8 macro commands, created to simplify the user's task, will probably not be enough in front of such an amount of possible controls. Furthermore, in order to visualize the whole system each track containing a rack can be displayed into subtracks in the Session window. Impressive. But the great novelties from this version are called Tension, Electric and Analog, three new virtual instruments developed in collaboration with Applied Acoustic Systems (AAS). Well they aren't that new actually, as these 3 synths are simply integrated and paying versions of respectively String Studio VS-1, Lounge Lizard EP-3 and Ultra Analog Session, all of them remarkable by the way. Their main interest lies in their total integration inside of Instrument Racks that include MIDI and audio effects (just as you'd find in Logic), which is illustrated by the numerous and very musical presets. We won't go into detail about these physical modeling synths, as they have all been tested many times before, but anyway Tension is an emulation of string instruments using hammers, picks, bows and so on, various types of strings, soundboards, dampers, vibratos and others plus a filter, an envelope and a LFO. By far the most complex of the three, it offers an extraordinarily rich – though specific – panel of sounds. Electric emulates electric pianos like Fender Rhodes or Würlitzer in a very efficient way, and works extremely well with the Live Saturator plug-in. Finally Analog is a very powerful analog subtractive synthesizer coming with 2 oscillators, 2 filters, 2 envelopes and 2 LFOs, and is capable of superb softness as well as high aggressiveness. Impressive in a session, this synths trio isn't of course really new but has a remarkable quality despite its intensive use of CPU. Live 7 Suite also includes version 2 of the Essential Instrument Collection (not tested), and Drum Racks are going wild with Session Drums (not tested) and Drum Machines, 2 fully loaded sample banks. It's just a pity that all of this is paying options. The main criticism one could do to Live's video section is that it only takes QuickTime files into account… on the paper! Indeed simple experimentations proved that mp4 and most avi files can be used as well. No mpeg-2 on the other hand, but what a nice surprise! NTSC is now supported within Time Codes, and a video export is now available depending on which encoders you have (avi, QuickTime, DV and others). On the ergonomics side we found a new temporary tempo control, made to manually synchronize our sessions with unsynchronized sources, and a mapping of Live's tempo to control the coarse as well as its fine tune. Multiple automation envelopes have finally appeared in the Arrangement window and the Edit button has been put back into the audio clip editor, allowing us to work easily on the sound in Peak or Sound Forge for instance. Absent since Live 5, we missed it… Thanks. It is also possible to edit information texts for every single track, scene, clip, rack or effect. The text replaces then the online help, in the down left corner of the screen. Oh yes, a default to indicate in this category: it is not at all practical to systematically have to use Midi Learn to automate the functions of Live, notably when there is a long and precise list to be brought in or corrections to be made. Let's hope this will evolve in a next update. The very last update, which is the one we tested, doesn't correct any of the big flaws or defaults we have been describing in this article. Nevertheless it contains so many bug corrections and small improvements that we had to tell about a few. Like the Control Surface support for the MIDI Faderfox LV1, LX1, LV2, LX2, LC2 & LD2, Korg ZERO and Akai MPD32, as well as the Drum Rack support for Korg KONTROL49 and microKONTROL. Recycle 1 files are also supported, which is a good thing. About corrections now we'll signal among lots of other things that until now freezing tracks containing Analog, Electric or Tension didn't work properly, that video exports with 24 or 32 bit usually resulted in distorted audio (which funnily we checked by mistake), and that to change the plug-in buffer size could result in incorrect delay compensation. You get the point: this update is very much recommended for every user, especially if you have to play live soon. On the whole Live 7 relies on the quality of its previous version, and doesn't question at all its own principles: the add of synthesizers, of sample banks and of numerous ergonomic details make it more of a Super Live 6, or maybe a Live 6.1 with multiple paying options and of course more CPU drain (although the movements in the CPU indicator seemed more stable than before). Anyway the ensemble is both reassuring and disappointing at the same time: of course all these add-ons are very welcome and we're happy not to have to learn the whole software again, yet a real improvement of the audio engine and of the pitch-shift / time-stretch algorithms is beginning to feel like a necessity, as well as the possibility to record automation into clips, or a Back to Arrangement button for each individual track. Without mentioning the absence of a multi-screen mode in order to work with Live on two monitors… All in all ancient questions whose answers we've been waiting for since a few years and a few versions. But anyway; despite its complexification Live 7 is nice and works well… So let's enjoy! 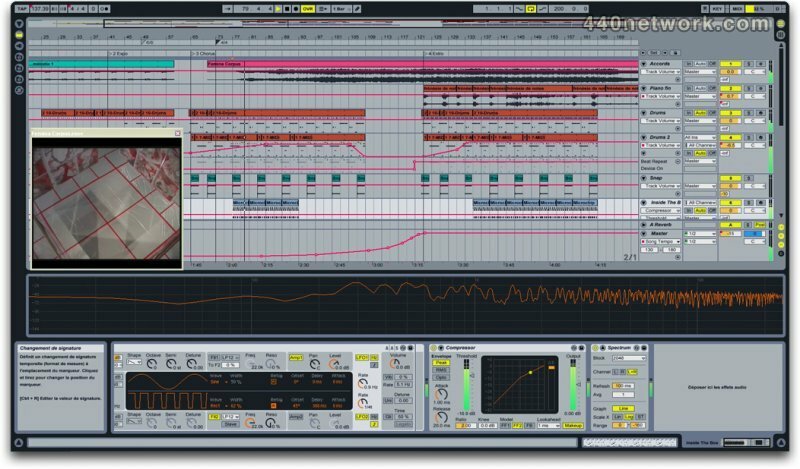 Ableton Suite and Ableton Live 7 are Ableton products.